This past week, I have been trying to figure out what else I might want to make with the "Sweetened Condensed Coconut Milk" (made with Swerve) I had leftover from making last weekend's "Absolutely Magical Cookie Bars". I had 1-1/2 cups of the condensed milk left to make something else with. Late last night...we are talking 11:00 pm (nuts...huh??? 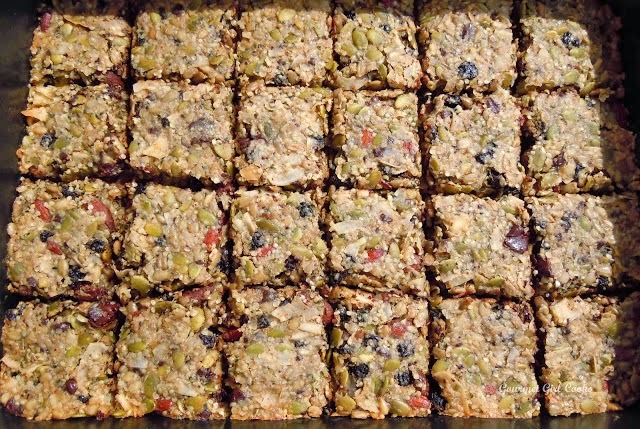 ), I decided to make "Seedy Power Bars". On one of my adventures to Whole Foods a couple months ago, I purchased all kinds of raw seeds to make something with. So, last night I put them to good use! 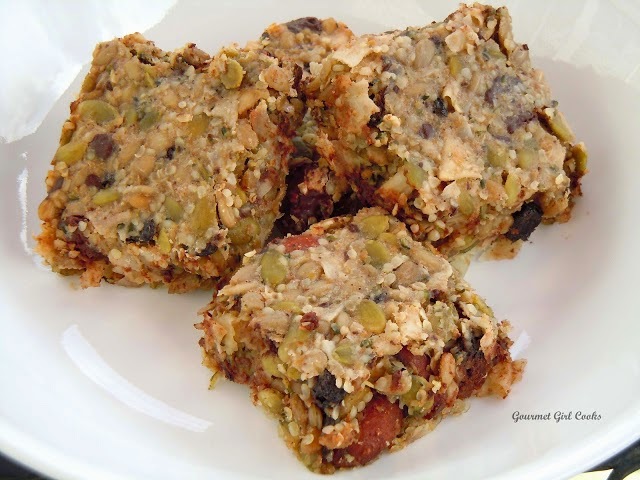 It was a concoction of raw seeds and a little dark chocolate, blueberries, coconut, roasted almonds and sunflower seeds. Now, these are not granola bars...because they are predominantly made of seeds. I used the condensed coconut milk as the glue to hold them all together. They turned out good. 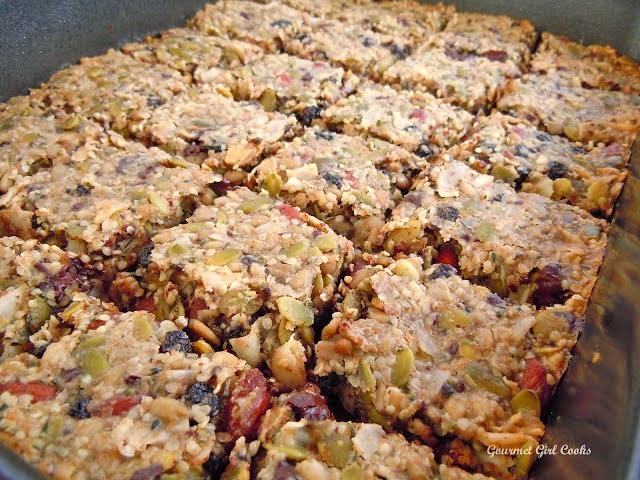 I must say, that even though I knew exactly what was in them -- I still was expecting them to be like chewy granola bars when I first bit into them since they sort of looked like granola type bars...LOL. I wasn't trying to achieve that...but old habits die young I guess. I made a 9x13" pan of them -- which is a LOT since I cut them into small bars. I cut them into 24 little power bars. Each bar has about 3 grams of sugar and 5 grams of net carbs (I rounded up to be safe). I purposely baked them at a low temp so I wouldn't roast the seeds too much -- I was going for more of a raw type finish...but I bet they'd also be really tasty (and crunchier, too) if the seeds were lightly toasted before mixing and baking. It was a very heavy pan of bars with all those dense seeds. I may try making half a batch next time using lightly roasted/toasted seeds to compare the difference. Below are a few pictures as well as the simple recipe I put together. Enjoy! Preheat oven to 250 degrees F. In a large bowl, place all ingredients and stir until everything is well coated (taste for sweetness and add additional sweetener, if necessary or desired). Press evenly, using a rubber spatula, into a lightly greased nonstick 9 x 13" baking pan. Bake at 250 degrees for 1 hour. If you prefer your bars lightly browned, increase the baking time a bit. Let cool about 20 minutes. Cut into bars while still in pan and allow to cool completely. Cover and refrigerate to keep firm and fresh. 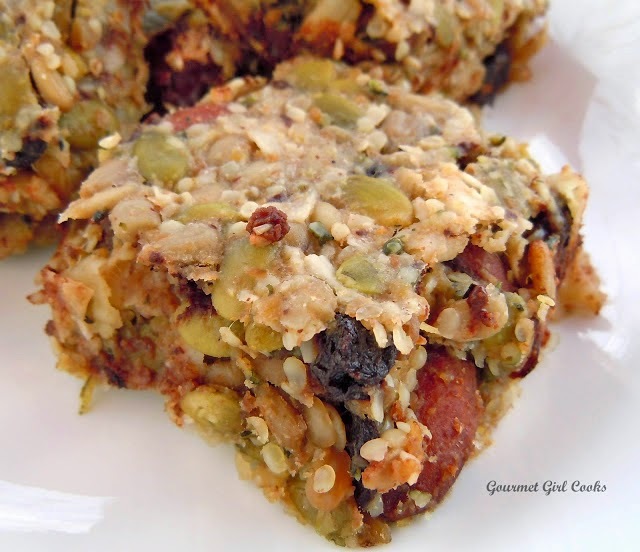 **Note: This recipe uses about 6 cups of "nuts/seeds/fruits/etc." mixed with 1-1/2 cups of Sweetened Condensed Coconut Milk. You can easily substitute or replace any of the power bar's ingredients if you don't like them or have them available -- just mix together about the same amount of your favorite ingredients. 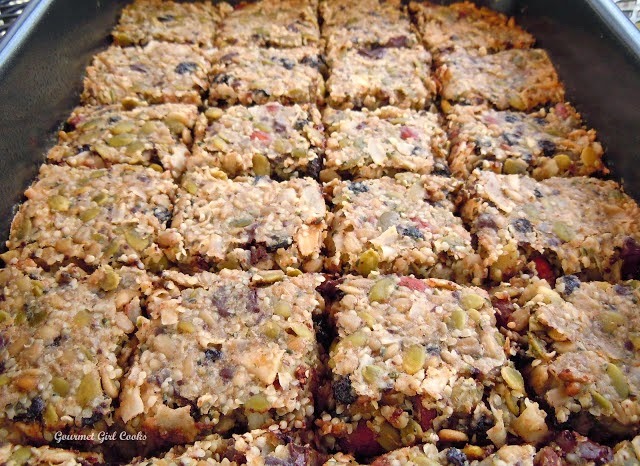 To make a half batch using an 8 x 8" pan, use 3 cups of mixed seeds, nuts, etc. mixed with 3/4 cup of the Sweetened Condensed Coconut Milk. I would make these RIGHT NOW if I had all the ingredients! That is some beautiful food art! Wow! Drooling. Those nutty bars look divine! Do you think chia seeds would work instead of the hemp? These look amazing! I thought though that dried fruit was not allowed on the wheat belly list? My husband bought some Kind bars today, saying, I bet you could make something like this. I thought of this recipe and will definitely be trying it this weekend. Hi...could you make the sweetened condensed milk recipe with 1/2 and 1/2 instead of the coconut milk? These look great, but I'll have to figure out what to use instead of the ground flax. I can't have it due to it's estrogenic properties.